Riviera Nayarit will prove that luxury is our nature at the celebration of the International Tourism Fair in Madrid (Fitur), which will take place between January 30 and February 3, and will assemble over 100,000 professionals of the touristic industry worldwide. In 2013, Riviera Nayarit will once again be featured in Mexico’s Pavilion, where it’ll promote the natural wonders of its more than 180 miles of beaches in Nayarit, as well as its sister brands: Nayarit Colonial, Sierra del Nayar and Lagunas Encantadas, proving that working together with the private sector, the Government for the People headed by Roberto Sandoval Castañeda is working to benefit all the People in Nayarit. During the 33rd edition of Fitur, the Convention and Visitors Bureau (CVB) of Riviera Nayarit will bring the already traditional representation of Huichol artists, the coffee of Riviera Nayarit, and the Mexcaltitán Ballet, which will grace the Mexican Pavilion and will attract participants. It’s also expected that the CVB of Riviera Nayarit and representatives of the Government for the People will hold important business meeting with wholesalers, tour operators and airlines to try to increase the number of tourists coming to our State. 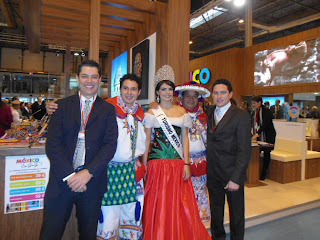 Fitur Madrid constitutes the most important business platform for tourism in Latin America. In 2012, the event assembled over 119,661 industry professionals and had over 63,000 exhibitors, and 210,000 people attended the event looking for information for their upcoming vacation.